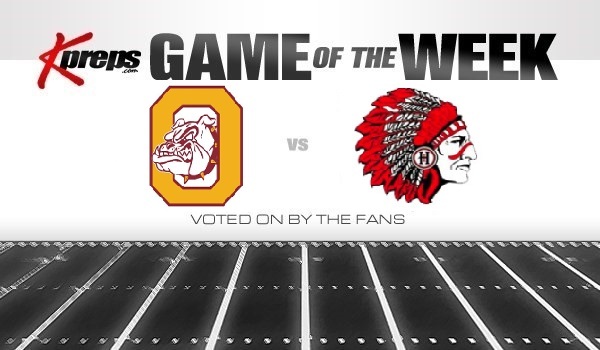 In Week 1, Osborne defeated Hill City, 88-76. Senior quarterback Darnell Holloway garnered statewide attention with 24 carries for 356 yards and seven rushing scores. He also completed 7 of 10 passes for 94 yards and a TD. Overall, Osborne rushed for 668 yards on 74 carries, four off the eight-man state record, according to the Kansas Sports Hall of Fame. Holloway and the Bulldogs’ big night came in Osborne’s change to the flexbone offense, a formation that is rarely run at the eight-man level. Osborne last used the flexbone in 11-man football back in 2009 under former coach Cullen Riner. He currently serves as the assistant to first-year head coach Brandon Wise. “I don’t really know that anyone in the state is really running what we are running,” Wise said. On Friday, Osborne, ranked No. 2 in Eight-Man, Division II, travels to Hoxie, top-ranked in Division I. The defending Division I state champions, the Indians opened with a 44-18 win against Tribune-Greeley County. Hoxie played without senior all-state lineman Colton Heskett because of an ankle sprain suffered in preseason practice. Heskett is expected to return Friday. This is a rare non-district, non-conference matchup between state powers. Osborne athletic director Doug Ubelaker called Baar about scheduling the game. Baar was intrigued and checked with his league schools first. Osborne, of the Northern Plains League, and Hoxie, from the Northwest Kansas League, have been consistent since both moved to eight-man football before the 2010 season. Similar to this year, Hoxie is known for defense, while Osborne has its high-octane offense. Hoxie, with a distinct size advantage in 2017 and again this year, has a collective 58-22 record with average margin of 40-18 in its eight-man history. Osborne, known for its speed and athletes, is 76-16 in eight-man with an average score of 51-27. “There’s several kids on that team, they get the ball in space, no one is going to catch them,” Baar said. The Bulldogs have the eight-man state record with 764 points in ’16, while Hoxie permitted nine points a game in ’17, second-best in eight-man football. Osborne won four straight in the series from ’08-11. Hoxie captured the only other two meetings in ’78 and ’03, according to Kansasfootballhistory.com. Osborne lists 14 players on the roster with four seniors, including senior center Jordan Wherry, easily the team’s biggest player at 6-foot-5, 270 pounds. Holloway is the second-biggest at 6-3, 195. Senior left guard Lee Carlin, a Week 1 starter, suffered a shoulder injury and is expected to miss around six weeks. Juniors Vaughn Stull, a Natoma transfer and Tiger quarterback last year, and Steele Wolters start at end. Sophomore Lance Kaser is at right guard. Hoxie has five players at least 215 pounds. While Baar labeled the overall performance “pretty flat,” especially early, against an improved Greeley County team, he said several players played well in new roles. Senior Taye Washington (6-5, 325) moved to guard from center with Heskett out. Sophomore backup Harlan Obioha (6-8, 310) stepped in at center. Senior Sam Bretz, another first-year starter, played well at guard and collected two TFLs. Hoxie has lost some backups to injuries and should have 23 players Friday. “Sam has always been a 100 percent, all the time type of guy,” Baar said. “He’s the kind of guy that you love, especially these last few years where he wasn’t in that starting role, he was in kind of that next man up role, and he gave us looks. Senior Jarrod Dible (5-11, 220) moved out to end and keyed a strong offensive effort after running back Latham Schwarz, the classification offensive player of the year, graduated. Senior quarterback Jared Kennedy, a returning starter, completed 6 of 12 passes for 112 yards with one score against one interception. He had 13 carries for a career-high 129 yards and a score. Junior Wylie Weems stepped in for Schwarz with 19 carries for 111 yards and a TD. Dible hauled in two catches for 77 yards and a score. Wise graduated from Derby and faced Hutchinson’s vaunted flexbone offense all four years. He played college football at Kansas Wesleyan. Then, Wise served as an assistant coach at Central Plains for four years under coach Chris Steiner. He was the head coach at Marais des Cygnes in ’15 and finished 1-8. Riner called Wise two years ago. Riner said he wanted to be the head coach one more year. Wise came last July and served as Riner’s assistant on a 9-2 squad that lost in an upset to St. Paul in the Division I quarterfinals. Then, Wise and Riner flipped roles. Wise went to a couple of clinics to learn more about the flexbone, which gives the option of three Bulldogs touching the ball at any point in time. He enjoyed watching the flexbone offenses like Army, Navy and Division II power Harding (Ark. ), and drew up plays and ideas on whiteboards, old mail, pieces of paper, napkins – whatever he could find. “Whenever something strikes me,” Wise said. In addition to Darnell Holloway, junior Darrien Holloway had 16 carries for 69 yards and two scores. Last year, Darnell’s season high was 19 carries. “He has the possibility of carrying the ball more in this offense than in other offenses,” Wise said. Senior running back Kade Miller had 18 carries for 153 yards and three scores, along with six tackles and two tackles for loss. Overall, he had 308 total yards of offense with 91 receiving and 64 kick return yards. Miller, known for his defense in the past, entered this year with 587 all-purpose yards in his career. Overall, he has 145 tackles, 16 TFLs and 13 interceptions.